Summary: Seventeen-year-old Riven is as tough as they come. 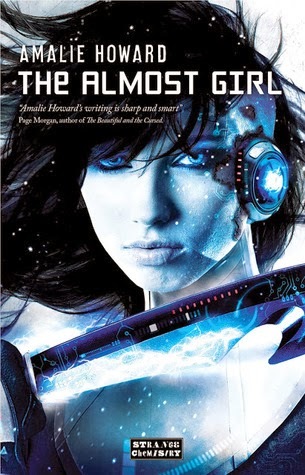 Coming from a world ravaged by a devastating android war, she has to be. There’s no room for softness, no room for emotion, no room for mistakes. A Legion General, she is the right hand of the young Prince of Neospes, a parallel universe to Earth. In Neospes, she has everything: rank, responsibility and respect. But when Prince Cale sends her away to find his long-lost brother, Caden, who has been spirited back to modern day Earth, Riven finds herself in uncharted territory. Thrown out of her comfort zone but with the mindset of a soldier, Riven has to learn how to be a girl in a realm that is the opposite of what she knows. Riven isn’t prepared for the beauty of a world that is unlike her own in so many ways. Nor is she prepared to feel something more than indifference for the very target she seeks. Caden is nothing like Cale, but he makes something in her come alive, igniting a spark deep down that goes against every cell in her body. For the first time in her life, Riven isn’t sure about her purpose, about her calling. Torn between duty and desire, she must decide whether Caden is simply a target or whether he is something more. Faced with hideous reanimated Vector soldiers from her own world with agendas of their own, as well as an unexpected reunion with a sister who despises her, it is a race against time to bring Caden back to Neospes. But things aren’t always as they seem, and Riven will have to search for truth. Family betrayals and royal coups are only the tip of the iceberg. Will Riven be able to find the strength to defy her very nature? Or will she become the monstrous soldier she was designed to be? Review: I'm actually a bit torn on this book, mostly because there are elements of it that I loved, and others that made me want to scream in frustration. Riven is only fourteen years old when she goes to a world incredibly different from her own, sent there to bring home the twin brother of Prince Cale, one of her closest friends and her commander. Riven comes from a world that has been torn apart by an android war, a world where creatures call Vectors are commonplace - corpses reanimated to be soldiers. It's a dark world in comparison to Earth, so will Riven be able to find her way and complete her mission? Sounds pretty cool, right? A young girl, trained to be a fighter, hopping universes to bring someone back, fighting the undead and triumphing over everything! I mean come on, I love Buffy the Vampire Slayer, was I really going to turn down a book like this? We need more books with fearless girls as confident and competent assassins, because the idea is pretty freaking cool. What I actually got in the book was a bit more fuzzy, though. First of all, I liked Riven. I wanted to like her more than I did, but I liked her. She's torn by duty and familial ties, and she doesn't like it when emotions get in the way - okay, something that I can understand, when she's been raised as a soldier. She prides herself in being the best, in not letting anything cloud her judgement, and completing her mission is paramount above everything else. She's gone through a lot in life - she's not particularly close to her father, he just sees her as a tool. Her mother is dead and her relationship with her sister is strained. All of this makes for a compelling character - I could see where she was coming from, in a lot of her struggles. They made sense to me. I loved the world, too - it was fascinating in a lot of ways. World torn about by android wars? Hell yes. A world that's drastically different from ours? Hell yes. Reanimated zombie people working as soldiers? Another hell yes. There's a lot to be said for the world that Howard has built and that was, in part, what kept me reading - I was curious, and I was fascinated. It was just that everything moved far too fast, as is common in so many books, now. I don't know how much time went by in this book, but it wasn't all that long - yet Riven goes through changes of heart that are extreme, her emotions all over the place. Standard teenage fare, admittedly - except she's been trained as a hardened soldier! I expect some inner drama and questioning, yes, but not to the extent that I read in the book. I'm not sure whether or not the author took the time to think about just how fast a person actually changes their mind when they've been trained all their lives. Admittedly it's not an easy topic for a civilian to identify with - most of us have no idea what a soldier goes through, both mentally and physically. I think that writers need to research thoroughly and really think about how quickly someone indoctrinated with a certain point of view can change their mind, though. If you're writing a character fighting hard against certain emotions and feelings, chances are they're going to win out most of the time, certainly longer than just a few days! This leads into the relationship with Caden, which, while well written in some ways, was a disappointment in a lot of others. The advice I seem to repeat over and over again for authors is always the same: SLOW DOWN!!! Caden was sweet, and gorgeous, of course. Thinking back on it now, though, I'm struggling to put much personality on him. Riven thinks of him in relationship to Cale a lot, and how he's different from Cale. So he's the antithesis of this boy that she knew (who we don't actually know that much about), but we don't learn that much about HIM, either, except that he's smart, a good fighter, and loyal to her (though I'm not quite sure why). Which is actually a bit of a sidetrack from what I was going to say, which is that Riven and Caden's relationship develops far, far too fast. I'll give Howard credit for writing things well in terms of describing the feelings - no 'omg he's so hot' sort of insta-love. In spite of that, though, the depth just isn't there. Yes, he apparently ~sees her for her~ (apparently on instinct, since any logical boy WOULD NOT trust her), but other than the tension that sparks between them and his apparent determination to see the best in her, I don't know what's drawing them together. It's a pity, because I don't dislike the pairing - Caden's sweet, and I think he'd be good for Riven. I still need a reason for her to fall for him that's not 'he's like Cale and he likes me' and I need a reason for him to like her that isn't 'she's hot and for some reason I trust her'. The Vectors are creepy, and Riven's struggle with her own background is touching, as well. It's a bit too obvious from the title, imo, but I think it'll be interesting to see how it develops in the next book. Ah yes, the next book... I'm assuming that there'll be one. Would I give it a try? Probably, in spite of all the things I've picked apart here. The writing is engaging enough, and I have hope that Howard will work on the flaws that are mentioned in various reviews of this book. Disclosure: I received a copy through Netgalley in exchange for an honest review.